Digital Currency: Africa in general and Uganda in particular, are cash economies. MM just allows people to move money from one place to another very quickly. 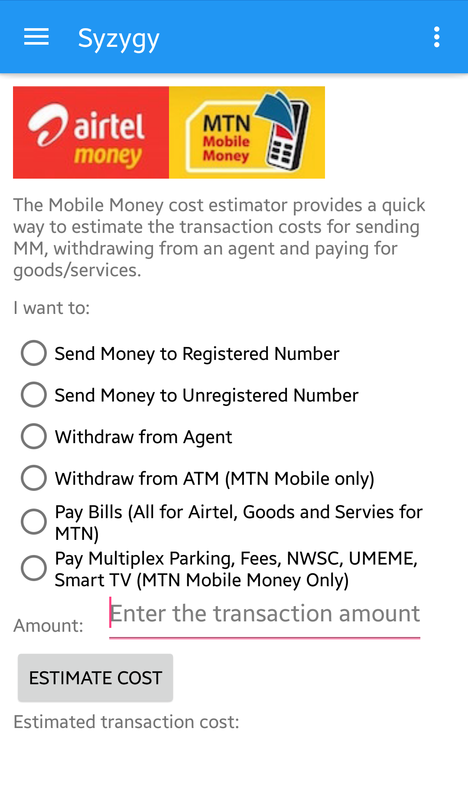 The cost of sending MM is usually less than transportation and time for moving to acutally deliver the money without the risk. MM is a defensive option for telecoms as their core business is getting eroded, and will evolve in order to remain relevant. I do not see any startup having the size, and capabilities to compete with the telecoms in this market, Uganda in particular and Africa in general. Even in Asia the agents are the key, however managing them is not an easy process so the incumbents will remain in play for the next 5-10 years. Business environment shift: the telecoms are here to stay, and MM will evolve along with the business environment. Infrastructure challenges such as roads, railways which also provide a conducive environment for MM as an option for money transfer. The telecom wars in Uganda just got a new lease in life, however looking forward the next round will claim some casualties. Why do I call this Round 5? At this point each of the telcom companies operating in Uganda have voice bundles, data and internet plans plus mobile money platforms. With international calling plans falling towards zero, currently even cheaper than local network calls, social media/VOIP/Messaging applications cannibalizing SMS revenues, the battle for survival is ever-fierce with the any mis-step proving fatal. Mobile Money Partnerships – with banks, utilities, and other commercial players to entrench mobile money transfer deeper into the economics of the country. Service Partnerships – can be seen around data & internet services, so that the telecos are not reduced to dumb pipes. The agricultural, health and education sectors will see a new push for value added services via SMS in order to keep the users captive on a specific network. Family Bundles – with families having more than one phone, I see a push towards shared bundles to reduce the costs of new customer acquisition & increasing opportunity cost of switching. The impact of this tactic will be further complicated by the multi-sim phones that most consumers have. Smart device leasing plans – one I have called for, complicated by lack of a national ID, but I see success for whoever nails a working version of business model first. Business Customers: Majority of the telecom usage is personal, however business customers provide an interesting selling point with a knock on effect for smart devices, family or business plans and shared bundles. Most users are forced to use a service or network convenient to the bread winner or trend setter. Quality of Service: after all that is said and done, when the costs are almost at par, the quality of service for a specific provider will become a critical deciding factor both for business and personal use. Mobile Virtual Network Operators – are they friend or are they foe? Partner or competition if running atop of your infrastructure? Number Portability – when this comes, it will disrupt the players as it abstracts the underlying providers. How do you see the telecoms responding to these threats, please share in the comments below …. June 2012 is here and well along with it comes some changes to my career (have not had any for the last 12 years), and while it brings up a host of new opportunities there is a swathe of new challenges too. So where do I start, I have been leading a team of software developers, and we have grown over the years through blood and sweat, while it has been an exciting journey, it has been a tough one. An opportunity arose and I have now changed tracks joined Mercy Corps (http://mercycorps.org) which is focused on changing lives through laser focused interventions which not only create a change in livelihoods, but are backed by an exit strategy for sustainability (which I find interesting, challenging and intriguing). In addition I will also be working to push technology to support the realization innovative program approaches that Mercy Corps is championing, to rephrase a common phrase “throwing bombs of IT innovations and solutions” and watching their effects.